Matt Barrow And The All Nighters » MATT BARROW & THE ALL NIGHTERS at the 32! 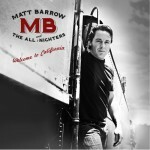 Home » Events » MATT BARROW & THE ALL NIGHTERS at the 32! MATT BARROW & THE ALL NIGHTERS at the 32! Ireland’s 32 is the best kept secret in LA. Some of the best music you will hear in town is played there every night! And December 20th we will take over the place for a full night of MB & The All Nighters!